Escape at the 'Gateway to the 10,000 Islands' and stay in this 1-bathroom vacation rental studio cabin in Everglades City, with accommodations for up to 2 people. This home is ideally located to take advantage of everything Everglades National Park has to offer. Explore the area on an airboat, dine on fresh seafood, or just relax on the screened-in porch. Unplug from your stresses and immerse yourself in nature with friends and family for your next vacation! Step inside and relax under exposed wood beams which accent the vaulted ceiling in this quaint studio cabin. Cook delicious snacks for everyone in the kitchenette's microwave or take a seat and stream your favorite shows or movies on the flat-screen TV with Netflix. Head out to the screened-in porch for some fresh air and sit around the circular rattan table to discuss all of the fun activities you've planned for your trip. At night, take scenic strolls along the bay and watch as the sun sets beyond the water. You'll enjoy rinsing off in the walk-in shower before you crawl under the sheets of the plush queen bed for a good night's rest. During your stay, you'll have access to a boat slip for added convenience on your Everglades adventures. If you're traveling with additional guests, check the availability of Evolve listing #372703. This unit is attached and sleeps 3 additional guests. 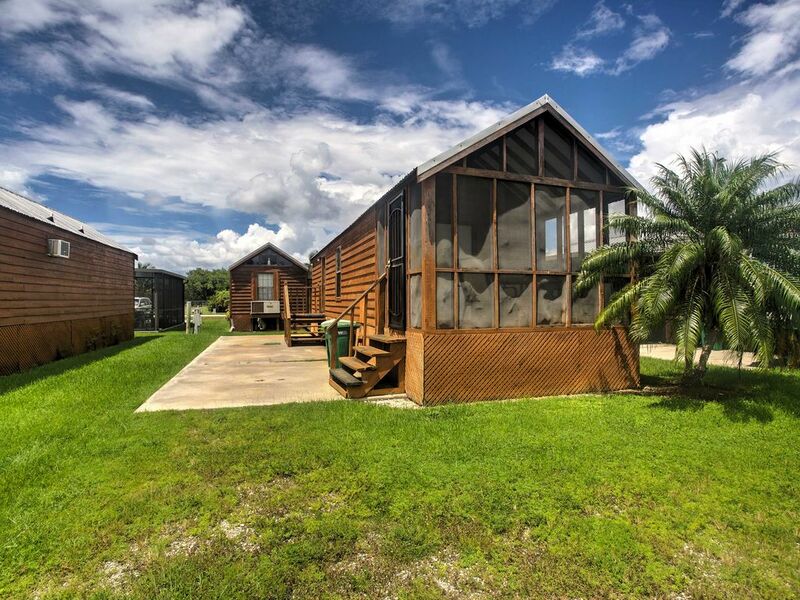 This cozy studio cabin offers an ideal location in Everglades City, which is an outdoor enthusiast’s dream with endless activities to keep you busy throughout your getaway. Book a fishing charter with Captain Glenn at Fishing The Everglades, just 300-feet from the property, for a chance to land a Tarpon, Snook, or Redfish. Across the street you'll find Everglades Kayak Company, where you can rent a kayak or canoe for yourself or book a tour with the experts. Learn about the 2,000-year history of the area when you visit the Museum of the Everglades. Set in an old commercial laundry building, the museum offers permanent and rotating exhibits that tell the story of those brave enough to settle this lush area. When you don't want to cook at home, you can take a stroll across the street to the Oyster House Restaurant & Bar for world-class seafood in a casual setting. - Secluded Everglades City location - A cozy studio cabin close to fishing, kayaking, airboat tours, restaurants, shopping, the Museum of the Everglades, hiking, and more! Access to several entrances to the Everglades National Park made this a wonderful location. If you are fine with rustic and don’t plan to hang out inside then all is well. The screened in porch had a minimal amount of shade and little protection from mosquitoes and no- seeums so we just kept moving. Everything was clean and maintained. Clean, compact, very small water heater. Good value. Learn to take a camp shower. It was in a quiet area. It was clean and I enjoyed the screened porch . Loved having the screened porch. As we are both tall the bathroom has a low ceiling so a different light fixture would have been a bonus for my husband who often hit his head on it. A paper towel holder in the kitchen area and toilet roll holder. Small things that could be remedied that would help to get repeat customers. We are not restaurant people so an electric frying pan would have been handy. All in all it worked for us. We did go to the Island Cafe which was a bustling place. The servers were excellent and enjoyed the alligator and shrimp meals. The cabin was cute and clean and it's right in the middle of the Everglades (which is what we wanted). My girlfriend was surprised the water pressure in the shower was so strong and she never ran out of hot water. The screened porch was a great place to hang out after hiking all day. We'll stay here again next time. If you stay here, remember to dive south and go to the Havana Cafe for breakfast or lunch, best food in the area.